Road Trip! Today Richard, his wife Sandy, and myself are hitting the road. We are leaving this morning to go to Bryson City, NC for Nantahala Brewing Company‘s Trail Magic #4 bottle release! It’s no secret that Greg at Nantahala brews some of the finest beer in the area. 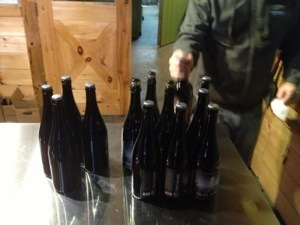 The last time I went for the bottle release, I drove up on Friday and spent the night in Bryson City. Well, Richard had planned on going Saturday and offered to drive. I agreed to go with him on Saturday and save the money on the hotel. Of course this frees up more money to buy beer! So I will be live blogging in real time the fun of our trip there and back. Any funny things said, beer drank, videos taken will all be uploaded from my iPhone. 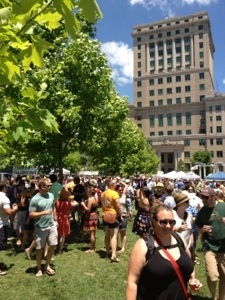 Subsequently, this is will also be my first guest post for the newly launched Asheville Beer Week website. 9:26 am: My ride just arrived. We’re taking I-40 to 74 from Knoxville to Bryson City. I usually take the scenic route through 441, but that’s not a possibility since the landslide. 10:18 am: You know that really curvy part on I-40 in the Smokies? It makes it really hard to type on an iPhone. On the plus side, I’m now officially in North Carolina. Woot! 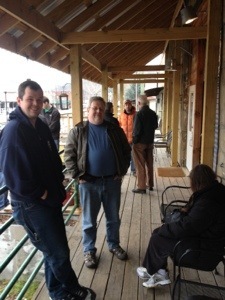 11:50 am: Here at Nantahala Brewing Company & hanging out. 10 minutes until the bottles go on sale. Hanging with Richard, Todd and head brewer Greg. Todd, Richard with head brew greg (in orange) in the background. Brew Mob Video! 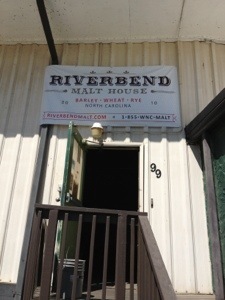 Click to see my interview with head brewer Greg. 12 pm. Go time! 4th in line waiting my turn. 12:25 I got my bottles and am enjoying the company of friends at the bar. My lovely selection of bottles: Trail Magic #1, 3, 4 and Chocolate Cherry Stout. 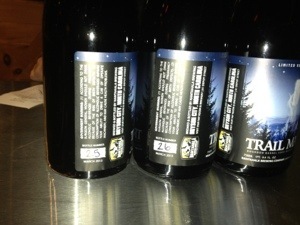 I got bottle numbers 25 through 28 of Trail Magic #4, Russian Imperial Stout aged in Maker’s Mark Barrels. 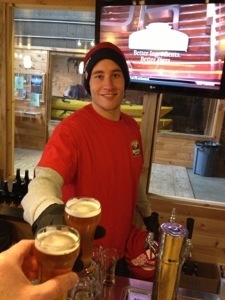 1 pm: Just explained the concept of vertical tastings to really cool Natahala beertender Harrison (as pictured below). Everyone at Nantahala Brewing Company is super cool. Harrison is no exception. Gotta love some barrel aged beers. 2:17 pm: Well after a few rounds of sample size beers, a tour if the brewery and a look at the barrel room courtesy of Greg, we’re back on the road. Next stop, Sylva, NC. 2:55 pm. Oh. My. Goddess! This is the BEST gas station beer selection EVER! The secret is out. Pj’s in Sylva. NC has the best gast station beer selection ever. 2011 Vintage in a lightproof box for $8? Shut up and take my money! Click here for a Brew Mob exclusive video of P. J.’s. After P.J.’s, it was time for a quick visit to Dieter and Heinzelmannchen Brewery. 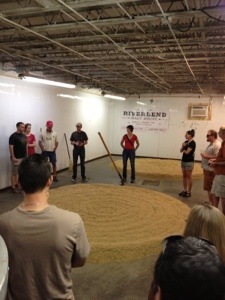 Inside the brewery/ tasting room. 4:45 pm: What a day! After Sylva we headed in to Asheville for a quick stop by Bruisin’ Ales. 5:30 pm: What a great day of beer based adventuring! 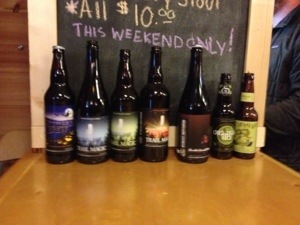 I tried many great beers, saw some good friends, and purchased a great selection of craft beer. We are currently heading home to Knoxville. I meant to be back sooner since I’m providing a tap box and CO2 set up for a friend’s surprise birthday party tonight. I want to sincerely thank Richard for driving today. I was great seeing all my NC friends and I look forward to my next trip across the mountains. Thanks for everyone reading along online. I’d love to here from you in the comment section below. You are currently browsing the archives for the Trail Magic category.